On November 23, North Korea fired shots at the South Korean island of Yeonpyeong. South Korea fired back. The attack lasted for about an hour. Some South Koreans were killed, many were injured, and several homes were destroyed. North Korea says that it attacked the island, which is very close to its border, because South Korea was firing shots. South Korea says that it was doing some military drills, and all the shots it fired were on its own side of the border. North and South Korea have not been on good terms for many years, but this event was the biggest fight they have had since the Korean war. The North Korean government is very strict and controls many aspects of its citizens’ lives. It is very difficult to visit North Korea and for its citizens to leave. People don’t have access to many gadgets and conveniences. North Korea has nuclear technology (that can be used to create bombs) which has been a concern for many countries around the world in recent years. The country has been led by people from the same family since it was founded. Kim Il-sung was the leader from 1948 till he died in 1994. His son, Kim Jong-il, has been the leader since. Many believe that he has already selected one of his sons to be the next leader of North Korea. There isn’t much communication between North Korea and most of the world. 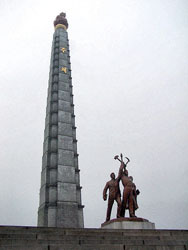 The Juche Tower is a famous landmark of North Korea. South Korea is democratic. The citizens of the country have a very high standard of living, and South Koreans are one of the world’s most hi-tech people.